"Slate tile and asphalt shingles are great choices for keeping with a style of a home, while also offering flexibility in design and color choices. " As a beautiful coastal state, Georgia is known for its southern charm and warm climate. However, living near the coast isn’t all its cracked up to be when a major storm hits homes across the state. Luckily, Georgia homes have been spared from many large hurricanes in the past, although the potential threat is always looming for local homeowners. When choosing the right roof material for a home in Georgia, there are two things to consider. Wood shakes are a poor choice for moist climates as they tend to hold moisture, resulting in mold and mildew. Concrete roof materials also make a poor choice and they can be porous, attracting and holding water for long periods of time. Metal, slate tile or asphalt shingles are best for a humid climate as they are all resistant to moisture damage. However, high winds associated with hurricanes can damage asphalt shingles easily if they are not in good repair beforehand. A lot of homes in Georgia have a historical value and appeal. 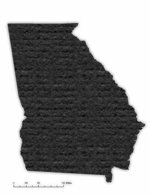 When thinking about replacing a roof on a home in Georgia, it is important to consider the style of the home. Pick a material that accentuates the homes style and matches the time period of the home. Slate tile and asphalt shingles are great choices for keeping with a style of a home, while also offering flexibility in design and color choices.